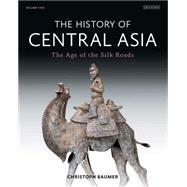 The Age of the Silk Roads (c 200 BC- c 900 AD) shaped the course of the future. The foundation by the Han dynasty of an extensive network of interlinking trade routes, collectively known as the Silk Road, led to an explosion of cultural and commercial transactions across Central Asia that had a profound impact on civilization. In this second volume of his authoritative history of the region, Christoph Baumer explores the unique flow of goods, peoples and ideas along the dusty tracks and wandering caravan routes that brought European and Mediterranean orbits into contact with Asia. The Silk Roads, the author shows, enabled the spread across the known world of Christianity, Manichaeism, Buddhism and Islam, just as earlier they had caused Roman citizens to crave the exotic silk goods of the mysterious Far East. Tracing the rise and fall of empires, this richly illustrated book charts the ebb and flow of epic history: the bitter rivalry of Rome and Parthia; the lucrative mercantile empire of the Sogdians; the founding of Samarkand; and Chinese defeat at the Battle of Talas (751 AD) by the forces of Islam. Christoph Baumer - a leading explorer and historian of Central Asia, Tibet and China - has written several well-received books in the fields of history, religion, archaeology and travel. These include The Church of the East: An Illustrated History of Assyrian Christianity, Traces in the Desert: Journeys of Discovery across Central Asia and China's Holy Mountain: An Illustrated Journey into the Heart of Buddhism, all published by I.B.Tauris. His ambitious four-volume study of Central Asia was launched in 2012 with volume 1, The History of Central Asia: The Age of the Steppe Warriors.